Children’s Courtyard takes an individualized approach to child care by taking each child’s unique learning style into account. For infants as young as 6 weeks, this means individualized lesson plans including motor skill enhancement, singing, physical explorations and sign language use. Coupled with caring teachers eager to offer up lots of cuddles in Mom and Dad’s absence, it’s easy to see why Children’s Courtyard has been a trusted resource for local parents since its inception in 1986. 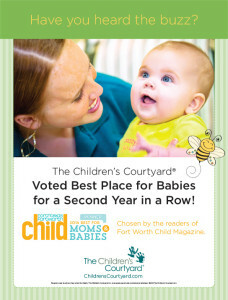 We’re doing lots to celebrate, including hosting an all-day baby shower on Friday, April 4, 2014, at all Children’s Courtyard locations in the Dallas-Fort Worth area! For more info, just find The Children’s Courtyard nearest you— then call or visit to see how to get involved.